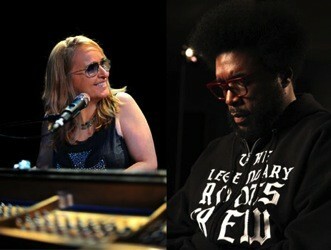 GrammyÂ® winner Melissa Etheridge, Credit: LEGIONPHOTO/Parker Gyokeres. GrammyÂ® winner Questlove of The Roots, Credit: Richard Trammell. HITMAKERS is an up-close look at the music industry’s resilience in the digital age, featuring interviews and performances from notable artists, including Grammy® Award-winning rocker Melissa Etheridge, multi-media star Questlove, Electronic Dance Music DJ/producer Steve Aoki, multiplatinum Grammy Award-winning singer Lorde, powerhouse soul/funk singer Sharon Jones and Grammy-winning blues rock group Tedeschi Trucks Band, along with legendary music executives. Airing on PBS Friday, November 14, 2014, 9:00 p.m.-10:00 p.m. ET, the music documentary is part of the 2014 PBS Arts Fall Festival, a primetime programming event with 11 weekly programs of classic Broadway hits and music from around the country, as well as acclaimed and award-winning theater performances. Directed by Susan Wittenberg and Carol Stein of Ace Pictures, HITMAKERS explores the changing face of the record industry — the first commercial medium to be profoundly disrupted by the Internet. It follows contemporary artists who challenge the long-established paradigm, taking control of their careers and sometimes recording and releasing music outside the traditional system. Entertaining and thoughtful, HITMAKERS looks deep into the evolving nature and definition of a “hit” record in a fragmented music industry. HITMAKERS tracks the progression of the music business from gramophones to laptops, record sales to Spotify. It chronicles the increasing importance of touring, concerts and social media, and the evolution of how artists are paid for their work. HITMAKERS is highlighted by performances from Ed Sheeran and Bruno Mars, as well as insights from music industry veterans, including Craig Kallman, chairman and CEO of Atlantic Records; Seymour Stein, founder of Sire Records and vice president of Warner Bros. Records, who signed 1970s and 80s iconic music makers, including Madonna, Talking Heads and Ramones; Richard Gottehrer, a producer and co-founder of independent music and video distribution company The Orchard; and Bill Werde, former editorial director of Billboard magazine, among others. HITMAKERS is produced by Ace Pictures, Inc., which specializes in films about the arts. The company’s credits include “Nashville 2.0: The Rise of Americana,” a special featuring the vibrant musical landscape of Nashville; “Women Who Rock,” a performance documentary celebrating female musicians, from early groundbreakers to contemporary powerhouses; “Pollock,” a film about the life of artist Jackson Pollock; “Midori and Friends”; and “The Tiger Lillies Live in Concert in NY.” Ace Pictures’ films have been seen on PBS, Ovation TV, A&E and around the world. HITMAKERS is part of the 2014 PBS Arts Fall Festival, an 11-week series hosted by Emmy and Tony Award-winning actress and accomplished singer Kristin Chenoweth. The remainder of this year’s festival includes: THE GERSHWINS’® PORGY AND BESSSM FROM SAN FRANCISCO OPERA; GREAT PERFORMANCES “Tony Bennett & Lady Gaga: Cheek To Cheek LIVE!” and “Cats; KRISTIN CHENOWETH: COMING HOME, the star performing in her hometown of Broken Arrow, Oklahoma; A TRIBUTE TO BRUCE SPRINGSTEEN, music’s biggest names performing Springsteen’s biggest hits; and more. The PBS Arts Festivals underscores PBS’ commitment to America’s best performing arts and gives its millions of viewers a front-row seat and a backstage pass to great cultural programs. For more, visit here. National funding for the PBS Arts Fall Festival is provided by a generous grant from Anne Ray Charitable Trust.